It's a constant frustration for musicians reading sheet music: When you hit the end of a page, you have to flip to the next -- mid-performance. Tonara uses iPads to do away with traditional paper sheets. When musicians play, the app listens to the tempo and follows along, picking out the right moment to flip the page. The app also records jam sessions and lets musicians share them on Facebook and Twitter. "This technology that will revolutionize the way people play music," CEO Yair Lavi predicted. Lool Ventures investor Avichay Nissenbaum thinks putting the sheet music industry into the digital realm will have big implications. "The same way iTunes disrupted the music industry by selling music by the song rather than the book, this will disrupt the sheet music industry -- there are many opportunities here to not only capture the existing market but to increase it," Nissenbaum said. One of the app's trickiest and most vital technical advantages is that it can isolate "its" musician among a group: It won't pick up on noise from other players in an ensemble. 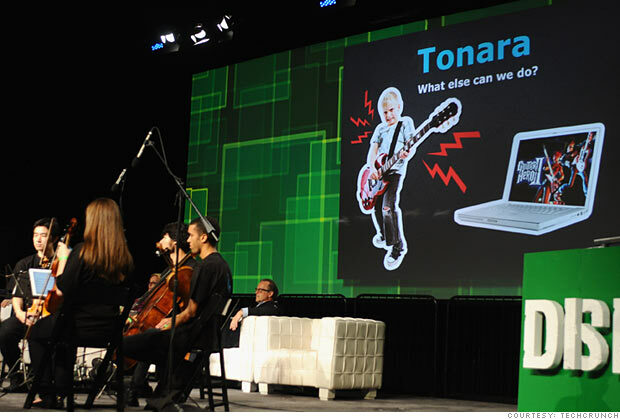 Tonara will be free, but users will need to pay for their digital sheet music.